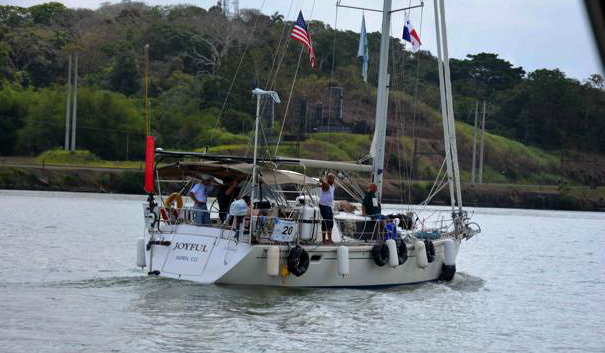 Aventura completed the Panama Canal transit on Sunday afternoon and we are now on our way to Tahiti. We have about 4800 miles ahead of us, which I plan to sail nonstop as we need to arrive in Tahiti at the beginning of May to meet the rest of the Blue Planet Odyssey boats. We are sailing an almost direct route, passing just west of the Galapagos Islands and continue to Marquesas and Tahiti. It has been a very quick turnaround in Panama as we only arrived last Thursday and had made arrangements to transit the canal on Saturday. Soon after we arrived, Aventura was inspected by a Panama Canal admeasurer. 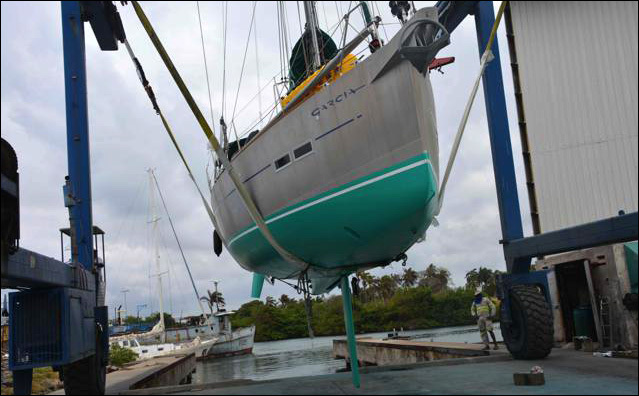 She was then hauled out and had two coats of antifouling paint applied. 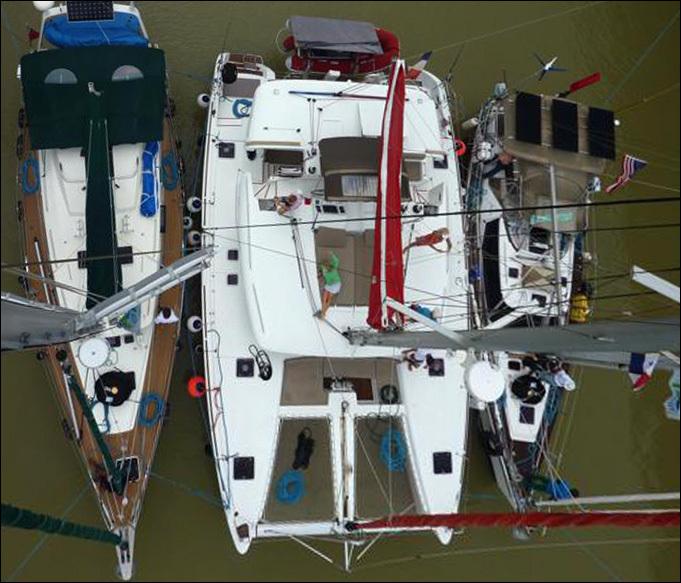 Conveniently located on the Caribbean side of the Panama Canal, Shelter Bay Marina is an efficiently run operation, with good docking ad repair facilities. The town and harbor of Cristobal Colon are named after Christopher Columbus, with the Spanish version of his name, Cristobal, being the port, and Colon (Columbus), the town. 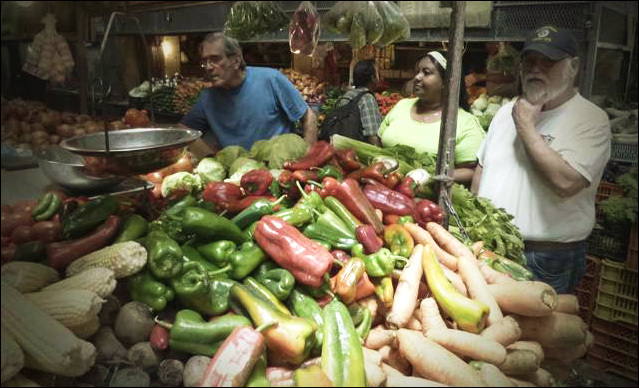 When provisioning the boat for a long passage it is essential to buy fruit, vegetables and eggs that had not been chilled or refrigerated and Colon market ranks as one of the best I have ever experienced. Just before we left the marina to pick up the pilot for the transit of the canal, Eric Bauhaus, visited us and presented me with his Panama Cruising Guide. A German sailor, who swallowed the anchor and now has a family here, Eric has produced the ultimate guide to Panama and its cruising attractions. 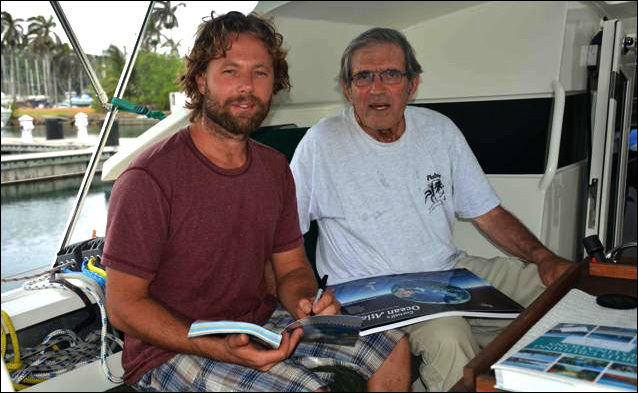 The book is illustrated with excellent detailed charts, which he produced himself by taking soundings in all anchorages, including the San Blas and Perlas Islands. The French catamaran Silhouette flanked by Aventura and Joyful for the canal transit. To pass though the six locks, small boats are normally rafted together in so-called nests. 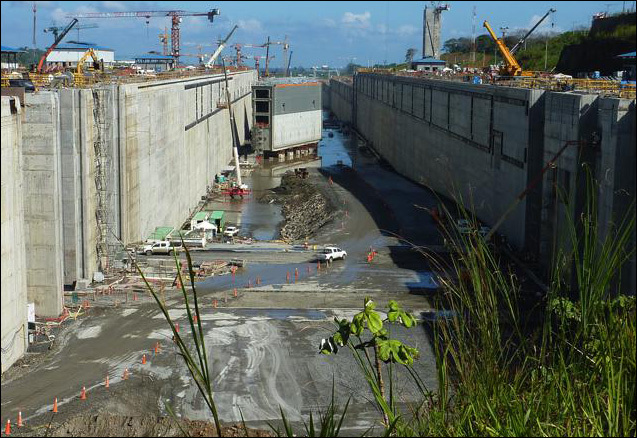 On Saturday evening we negotiated the three Gatun Locks that took us into Gatun Lake, situated 27 meters above sea level. 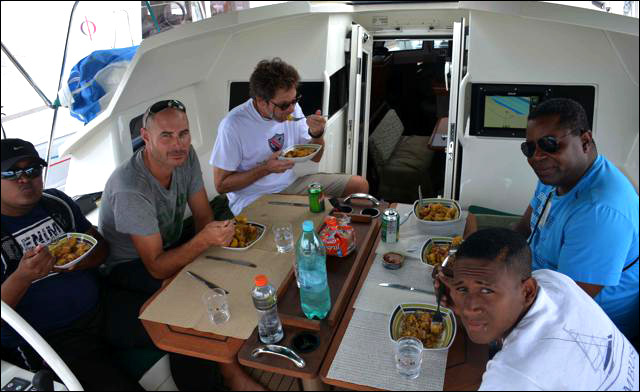 We spent the night in Gatun Lake, and resumed the transit the following morning. The gigantic new lock and gates. On the way we passed the site of the new canal. The expansion project will double the capacity of the current canal by creating a new lane of traffic and allowing more and much larger ships to transit. The project involves building two new locks, one of their remarkable features being the lock gates. 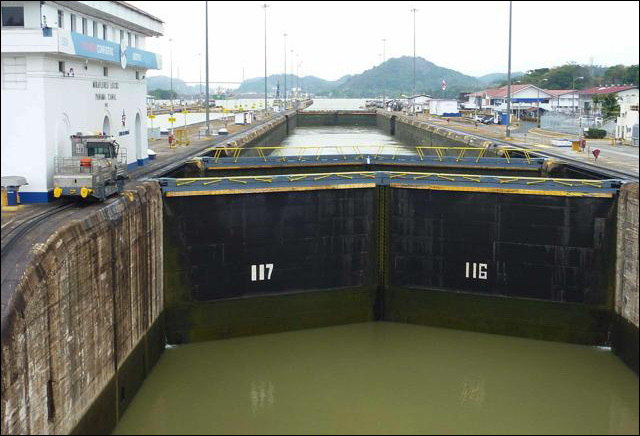 Instead of having swinging pairs of gates, as in the current locks, the new massive gates slide across to close or open the lock, each gate weighing over 4000 tons being 30 metres high, 53 metres wide, and 3 metres thick. 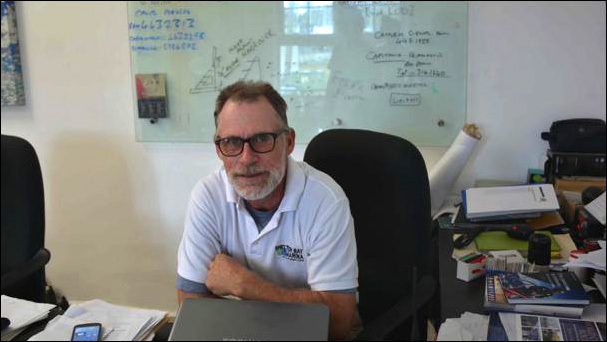 Anne and Jeff Posner’s Joyful had missed the Blue Planet Odyssey start in January, and will attempt to catch up with the fleet in Bora Bora. This is the fourth Aventura to transit the Panama Canal following our first passage in 1977, the second in 1991 and the third in 2002. A long voyage lies ahead of us, and I hope you’ll follow our progress as we sail across the South Seas bound for Tahiti.